For those of you that haven't heard, Eric's grandpa passed away this Tuesday, June 8. He was a great man to everyone he met and a hero even to those that never met him. The photo was taken 4 years ago at our wedding. We miss you grandpa. The following is the obituary written by Freeman Harris Funeral Home. 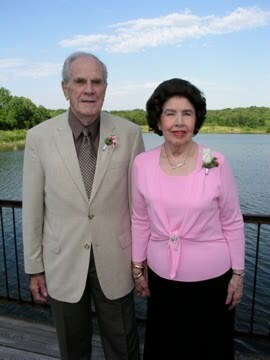 William Dennis Zellers, 86, of Tulsa passed away, Tuesday, June 8, 2010. He was born, January 8, 1924 in Lebanon, Pennsylvania. He was raised by a loving, aunt Bertha and uncle Simon Meyer after the death of his mother. He served in the US Army Air Corps during WWII as a Tech Sergeant with the 307th Bombardment Group. Mr. Zellers retired from American Airlines as a Quality Control Inspector with 38 years of service. He is survived by his family, those he loved and those who loved him, his wife of 64 years, Mildred (Burchette) Zellers of the home, son, William E. and wife, Holly Zellers of Coweta,OK; two grandchildren, Rachael Van Winkle, Eric and his wife Lesley Zellers of Tulsa, three great grandchildren, Will, Chloe and Jonathan; brother, Russell Yoder and his cousins, Junior and Deloras Meyer, who were like siblings. He was looking forward to the birth of his newest great granddaughter, Paisley Ann. His family was his delight. Graveside services will be 11AM Friday, June 11, 2010 in Memorial Park Cemetery.